Patch Brightwater is a boy in disgrace. Thrown in jail for playing a forbidden spell, he is no one's idea of a hero. But then he discovers a deadly truth – the evil Piper of Hamelyn is on the loose. With the help of Wren, a girl cursed to live as a rat, and Barver, a fire-breathing dracogriff, Patch must stop the Piper sparking the biggest battle of them all. Three accidental heroes versus one legendary villain... an epic adventure is born. S.A. Patrick was born in Belfast. When he was a child, he wanted to write video games, become an author, and have magical powers. The first two came true. If he ever does get magical powers, he hopes people like dragons and griffins because there’ll suddenly be a lot of them around. A Darkness of Dragons is his first book for children. The screams of the children brought the villagers running. The little ones often played among the tall pines at the southern edge of Patterfall. This high in the mountains, winter was always hard; the pines offered shelter from the icy winds that blew through the valley. As the villagers ran towards the sound, the panicked children emerged from the trees and came rushing through the snow. The first to reach them was Frer, the eight-year-old son of the baker. “It’s come! It’s come!” said the boy. He shook his head. “No, Elder. It’s the Ice Beast!” With that, he ran past them to safety. “The child is just scared,” the Elder told the other villagers, because the Ice Beast was a legend, nothing more. A legend as old as the village itself, about an extraordinary creature formed of snow and ice – a creature that absolutely did not exist. There were extraordinary creatures in the world, of course. Some, like dragons, were at least as intelligent as humans; others, like basilisks and manticores, were terrifying monstrosities. But there was nothing like that anywhere near Patterfall. Dragons lived on a different continent, far to the east; as for the terrifying monstrosities, they were thankfully rare, and limited to the remotest parts of the world. Only those foolish enough to get lost on the valley roads in deep winter ever claimed to have seen the Ice Beast – people who were exhausted and frightened, seeing things that weren’t really there. Yet the villagers could see movement a short way inside the forest. The Ice Beast was the height of a large man, and seemed to be made entirely of snow. Its legs and arms were as thick as tree trunks. The head was a featureless white ball, but every villager could imagine where the terrifying mouth was, fangs dripping, ready to sink into the flesh of anyone who got too near. Its slow steps drew a heavy crunch from the snow underneath. From its head came a steady moaning. And the villagers kept moving towards it. There was one child left, though. One small boy, too frightened to move, standing directly in the creature’s path – Hap Werner, only four years old. But Hap shook his head, rooted to the spot. The creature was getting closer to him. With no time to waste, the Elder raised the shovel she was carrying. “I’ll have you, Beast!” she cried, and ran towards the creature. The other villagers followed, wielding what weapons they had – hoes, pitchforks, brooms. The Elder was first to reach it, and she swung her shovel hard, hitting the Ice Beast’s head; the creature made a strange noise before falling to the snowy ground with a thud. There it lay, motionless, as the villagers surrounded it, ready to hit it again if it moved even a fraction. But where the shovel had hit its head, a few chunks of ice and snow were now gone, revealing something underneath. The villagers stared at what they saw: a very cold, very red nose, and below that, a very human mouth. For a moment the villagers looked at each other in shock. Then they began to scrape away what they could of the ice and snow that clung to the stranger. With each chunk removed he was smaller, lighter, yet what they found underneath was a curious giant, the legs and arms unnaturally thick. Only when more ice was cleared did it make sense to them. Layer upon layer of shirts and trousers; dozens, perhaps more. The stranger’s neck was thick with a hundred scarves, the hands and head puffed out by gloves and hats. Torn strips of material were densely wrapped around the face, gaps left only for the mouth, nose and eyes. Too heavy to carry, they dragged the unconscious stranger to the village, his legs and feet still ice-bound. In the village hall a fire was roaring, and they propped him up in a chair in front of the blazing logs, then began cutting and unravelling the layers with care. In one corner of the hall, the pile of discarded garments grew, while the unconscious stranger shrank, until all that was left was a thin figure slouched in a chair, with a long coat over his simple clothing. It was a boy, his hair dark and scruffy. “It’s certain death for anyone crazy enough to go that way!” said the villager. “And yet this boy made it through,” said the Elder, thoughtful. “There must be more to him than meets the eye!” She reached inside the boy’s coat and searched the deep pockets within. After a moment, she slowly pulled out her hand; with it came a wooden flute, the length of her forearm. Those watching gasped as they saw. It was not a flute, of course. The small finger holes were far more numerous, the layout much more complex, than on any flute they had ever seen. This was not a flute. I think this book is going to go down a STORM at school. I can’t wait to hand it to some of the readers in my class. A Darkness of Dragons is an inspired take on an old story, with engaging characters, a really good story and several unexpected twists. An unmissable fantasy from a talented voice. I loved the characters, the plot and the setting. I’m certain Patch and his friends will remain with me even now I’ve closed the book. this could turn out to be a fantastically popular new series. [...] S.A. Patrick has adapted the traditional fairy tale to create a fearsome character and then filled the plot with action, suspense and magic from start to finish. A Darkness of Dragons creates an exciting imaginary world that will leave children eager to get their hands on forthcoming sequels. A Darkness of Dragons is sheer brilliance in children’s fiction. I have not been this excited about a children’s series of books since a pubescent wizard called Harry Potter first leapt onto the scene. 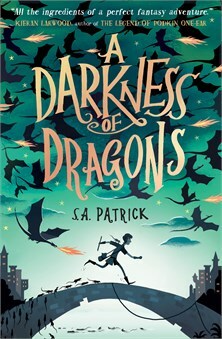 S.A. Patrick’s storytelling knows no bounds and is masterfully executed and Patrick builds a quite brilliant original tale whilst also creating an unforgettable magical world for his readers to escape into. an immersive magical world that will thrill its audience with its action-filled fantasy plot, its dark magic and its homage to the power of music. this stunning book reminds us of the soaring joy of adventure, the captivating danger of magic, and of the delight of finding friends in unexpected places. I liked that it was unique to all other fantasy books that I have read previously. I would recommend this book to my friends because it is full of imaginative characters as has an original story line that is full of captivating moments and plenty of surprises. It was amazing. Captured bu the first sentence and by the end of the first page, I couldn't put it down. It's brilliant, simply brilliant. It has everything from friends to adventure, but most all DRAGONS! Wow! Just wow! It has everything. A spin on a classic tale. Adventure, friendship and more! I kept thinking I know where this is going, but each time I was surprised by the sudden twists. Really kept me on my toes. It's full of adventure, friendship and magic - the perfect mix for everyone. I would recommend this book to my friends because it is really funny and it is very enjoyable. Wow! Everyone should read this book! This book is a twist on the tale of the Pied Piper of Hamelin. It has everything, adventure, friendship, twists and of course Dragons! You think you know where the tale is going and you turn the page and something else gets added in. It truly is an amazing book! I was gripped from the first page and could not put it down. Highly recommend to everyone of all ages! You will fall in love with the 3 main characters. Patch, 13 year old boy, Wren, a Rat! and Barver...well Barver is just amazing! Wish he was my friend. It is extremely interesting and will definitely keep the reader interested at all times! This is a brilliant fantasy booked based around the story of the Pied Piper Of Hamelin. The characters are really well described, Barver is my favourite character, he is really funny, yet managed to never did even though he is in situations where he should! The story is full of adventure to try and stop the evil Piper, easy to read as you really get into the story! This is both a beautifully written and very engaging fantasy tale. It has all the elements needed to capture the imagination of today’s children: magic, dragons, spells, fantasy world and delightful characters. It is has adventure and excitement in spades and will, I am sure, engage even the most reluctant readers. I intend to use it with my dyslexic students as an incentive to encourage them to enjoy reading for pleasure and escapism. I am already looking forward to the sequel. This book is full of adventure, mystery and fantasy as it is set in a magical world. A kind of sequel to The Pied Piper of Hamelyn, I recommend this book to brave readers of 8+. I can't wait for the next book to come out in 2019. This book had me gripped from start to finish. The story has a magical and exciting vibe with the author hooking you in so that you can't wait for what's coming next. Following the main character Patch, a disgraced Piper and his friend Wren, a rat, who together seek to find the truth about the Piper of Hamelyn. Will definitely look out for more offerings from S. A Patrick. This is a brilliant fantasy adventure story to introduce children to the genre. It mixes mythical creatures, magic with a well known fairytale that creates a really interesting story with lots of twists and turns along the way. Brilliant for children who like Harry Potter or the Hobbit. We can't wait for the next installment to come out. This book was inspired by The Pied Piper of Hamelin, and provides an excellent twist to this tale. I love the adventurous nature of this book and the language used to create the scenes is just brilliant. There is done interesting language within the book which provides opportunities for great discussions, as well as enhancing vocabularies. Such an imaginative story which you really can get lost within. I didn't want to put it down, such a gripping book. I don't want to give away too much about the plot and spoil it but I definitely recommend giving it a go! Download these book club questions for A Darkness of Dragons. Can you design your own magical musical instrument? What type of spells would it cast? Meet Patch – a thirteen-year-old very talented Piper, Wren – a girl who's been turned into a rat by a sorcerer, and Barver – a dracogriff (a cross between a dragon and a griffin).